Mittens Writes: After a week off, I need a week to recover. Today is the final day of Lulu's Spring Break week. She's back to school tomorrow. I have no idea how it happened, but I'm more exhausted today than I was at the beginning of last week. All the extra sleep was still not enough to make up for the Exhausting Weekend. I spent a day walking around the Nation's Capital, spent two days working at minor league baseball games, and spent another half day serving pancakes at a retirement community. I really need about a week where I don't have to drive anywhere. That would satisfy me. Sadly, it's not gonna happen for a while. I've been trying to find the time to get back to writing book 3 in the Thalia series, but every time I sit down at the computer, something else happens, and I get pulled away. I really need to find a week where I can hole up in a bubble and crank out pages. I've got the basic road map down, but I need the time to make the journey. And you say, "But you don't have a real job, how come you're so busy?" or "If you really wanted to do it, you'd make the time," and I say, Of course! But my kid takes priority over all of that. Why do you think I'm so tired? I've been staying up waaaay too late every night just to find some quiet time to write in. And I know it's worth it. Good thing I'm a night owl type. 1. The kid's first ever drama class play. She doesn't have a major role, but she has seven lines that I can't wait to hear! 3. Day Camp training weekend. I'm not sure if I'm going to be one of the chaperones on this trip, but if not, I'll have two solid days to write while Lulu is off learning how to be a camp counselor. 4. The next Honor Roll assembly at school, in a few weeks. Lulu made First Honors again, and I can't wait to go and cheer her on again. 5.The chorus concert. Lulu's first major chorus concert, since we were out of town for the Christmas concert last December. Unless she changes her mind, it will also be her last chorus concert, since she's ambivalent about signing up for next year. It is a lot of work, and it's a serious chorus where they expect all the members to participate fully. She doesn't want to spend that kind of time on it, and I can't argue with her. It has been a lot of driving and a lot of time in rehearsals, etc. I think that's pretty much it for the next month or so, but I'm content to know that all the time I spend doing things for her helps her be the great kid she is. If my writing suffers for it, or if my sleep schedule gets tossed out the window because of it, it's all worth it in the long run. I have priorities. Writing is definitely high up on that list, but it will never be as high as my kid. Or the Helper Monkey, but he can pretty much take care of himself. Oh, and because I was willing to give up a little of my precious writing time today, Lulu and I both ended up with ice cream from Jimmie Cone. She doesn't look happy, but that's because I'm taking her picture. Not because of the ice cream. 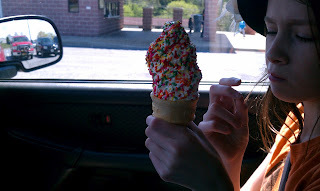 For those not located in Central Maryland, Jimmie Cone is a local institution. They turned 50 this year, and they're only open during the warm months. We patiently wait all winter just to get our first Jimmie Cone of the season. 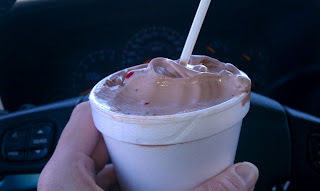 If you like soft-serve ice cream, you should make a pilgrimage to the original Jimmie Cone in Damascus. * Yum, yum! So when I think about it, sometimes I'm really glad I get pulled away from writing once in a while! *Note: I went into labor with Lulu about an hour after having a Jimmie Cone at the Damascus shop. That place always makes me smile!